Sales of prestige eye makeup products in the US grew 9 per cent, to US$ 1.1 billion in the twelve months ending December 2013, compared to the same time period last year, the The NPD Group reports. While fragrance sales remained flat last year, skincare and makeup were the main contributors of the U.S. prestige beauty market growth, revealedThe NPD Group. Eye makeup products, in particular, benefited from consumers’ growing interest in less traditional items. In a dynamic U.S. prestige beauty market  that grew by 5 per cent in 2013, makeup experienced healthy gains of 7 per cent, with sales of prestige eye products reaching US$ 1.1 billion (+9% compared to 2012). For instance, multi-benefit (+9%), volumizing (+11%), and long wear (+18%) products helped to drive the 2013 dollar sales growth in prestige mascara. Primarily, eyeliner growth came from pencils (+7%), long wear (+11%), and waterproof options (+10%). “Long wear is a theme that carried throughout eye makeup, showing sales growth in the eye brow products (+21%), and shadow (+9%) as well,” highlighted the market research firm. In general, the average selling price of prestige eye makeup was 3 per cent higher in the 12 months ending December 2013 than it was in the prior year. 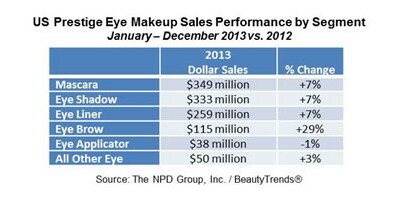 Eye shadow (+6%), brow (+4%), and liner (+3%) products experienced the largest increases in average selling price. With the exception of mascara, long wear products are garnering higher average selling prices than their counterparts in all segments.